After I posted the recipe for the fish, there were some that wanted the recipe for the Gluten Free Hushpuppies. So here it is! Hope you enjoy it! In medium size mixing bowl whisk together corn meal, GF flour, baking powder, salt and sugar. Add scallion, garlic, and jalapeno, oil, water, and beaten egg. Mix all ingredients well forming a stiff batter. In deep fryer or heavy sauce pan heat oil to 180 to 200*F. Dip batter by tablespoon forming an oblong ball or egg shape, and slide each ball into hot oil. Fry for 3- 4 minutes or until dark golden brown. Remove from oil and drain on paper towels. 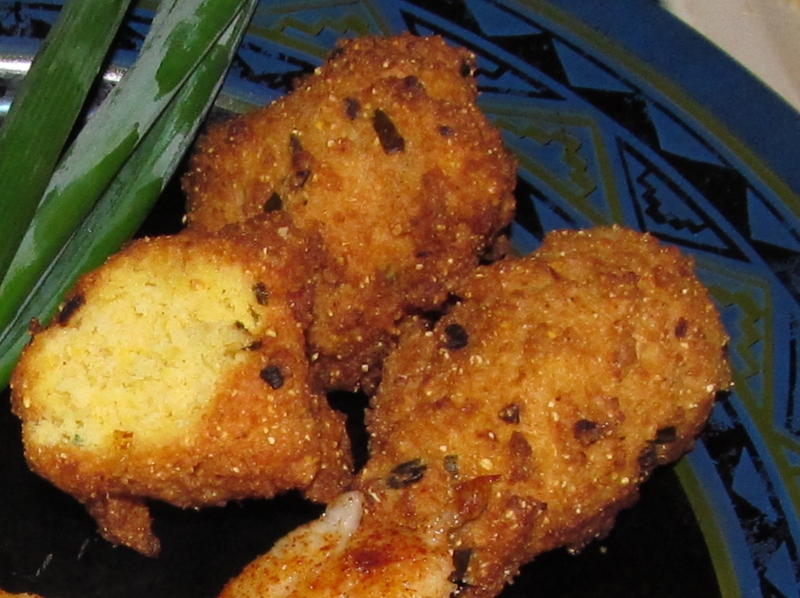 Depending on the size of each hushpuppy, this should make about 12 – 18 hushpuppies.